Social sciences network Mylifemysay was set up by students in several of London’s universities to bring together people working in the city with graduates in an event aimed at inspiring them to take an active part in politics. 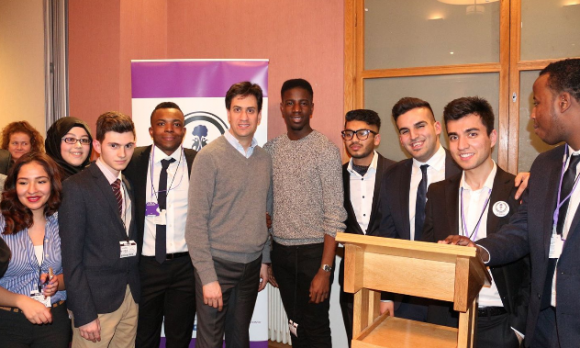 Labour Party Leader Ed Miliband joined their first public event at Westminster House, Millbank, to urge young participants to be active in politics. He was grilled by graduates on how his party dealt with the problems of young people after Education Maintenance Allowance (EMA) cuts came into force, which led to UK-wide protests. “This government abolished EMA in one sentence in one action. If you are 16-17 years old, get your voice heard in politics. I encourage you to stand as parliamentary candidates, council candidates. It is incredibly important to have the voice of the younger generation to challenge the older generation in parliament,” Miliband says. Students had a chance of networking with Richard Heaton, permanent secretary at the Cabinet Office, Rachel Oldroyd, deputy editor of The Bureau of Investigative Journalism, and Sakhr al-Makhadhi, an award-winning broadcast journalist specialising in Syria (from where he has reported since 2002) and many more highly experienced figures at the event. Mylifemysay was created last year and their current CEO is politics student Mete Coban who is the Labour Party Candidate in Stoke Newington for 2014 local elections. Members of Mylifemysay were asked to prepare a report to be submitted to a Parliamentary Commission on February 24 about young people’s insufficient participation in politics. “It is important to work on this report because the government have a right to know the reasons why young people are not engaged and how to tackle the issue of interest in politics,” the Mylifemysay CEO says.